A territory map is a geographic shape defining an area of responsibility. Using business mapping software, a territory alignment map is typically created by selecting or compiling a list of geographic districts, usually ZIP codes, counties or states. 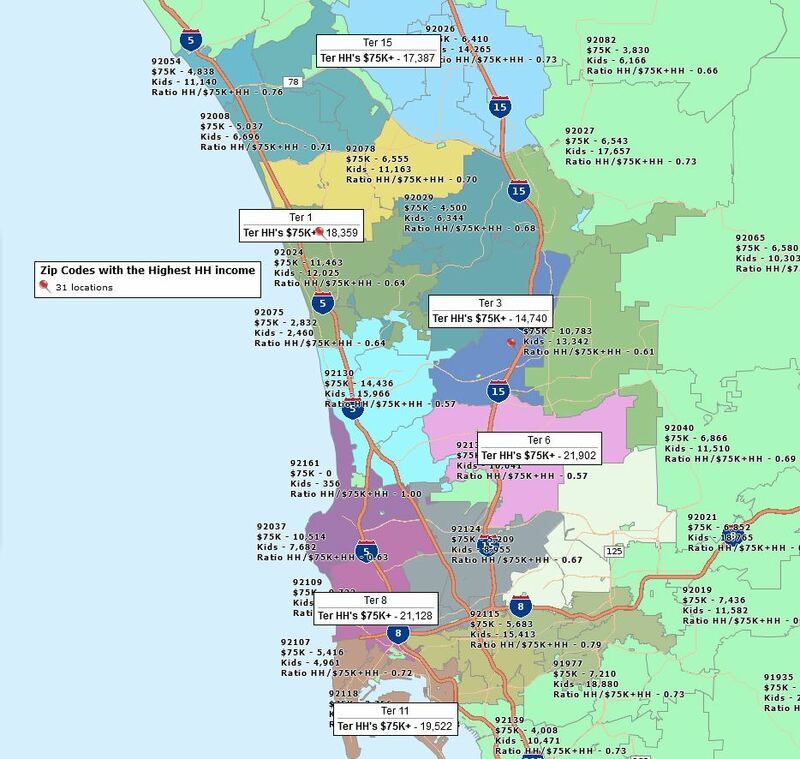 The software allows you to select a group of ZIP codes with a mouse/cursor selection tool or import a spreadsheet of preassigned ZIP codes associated with a column of territory names. Territory maps in business mapping software have both a visual color-shaded component and a data sheet view. Territory mapping is certainly a popular use case for business mapping software. Territory maps, done correctly, provide a platform for shared business objectives and shared results, potentially driving growth. Map Business Online, an affordable and easy-to-learn cloud-based business mapping option, makes sales territory mapping easy, compelling, and fun. Armed with no more than a laptop and a mouse, you can access www.MapBusinessOnline.com, sign up for the FREE trial, and create a territory using the administrative district layer of your choosing. Business map users most often apply ZIP codes to business territory mapping. For local and regional business, ZIP codes provide manageable areas of accountability which can be assigned to traveling clinicians, technicians, field agents or sales people. ZIP Codes also serve as convenient demographic data units that a lay person intuitively relates to. Territories are also often built around county or state geographies. If your business is super local, perhaps located deep in a metropolitan area, you may consider Census Tracts as your best territory base layer. Census Tracts are wicked small, especially in high population areas. I’ve seen home-care orgs use Census tracts to monitor clinician territories, which in metro areas require a lot of subway travel, complicating life in general. Map Business Online also included City Limits which can be applied to sales territory mapping, if your business is strictly city or town based. The Music Man would have used City limits to track the towns and cities he conned, especially if he franchised the biz. Sometimes companies want to avoid district based territories all together in favor of free-form territories. These approaches use highways, mountains, and rivers as territory boundaries. This can be achieved in Map Business Online by using draw tools to highlight areas manually. The territories will display on the map but analysis views are less direct and do not automatically apply to similar areas across the country. Also, drawn lines are less consistent in appearance as the map user adjusts zoom levels, where ZIP code lines, for instance, automatically snap to new zoom level views. Still, free form is an option. Territory maps generated using business mapping software, include data analysis views that combine disparate data layers into a detailed assessment of a territory’s underlying business DNA. You’ll be able to add population, income and ethnicity layers (to name a few) while appending your own imported business data. Territory data analysis assigns measurable data results to business processes. In this way, whether your map is for sales, healthcare or field services, territory maps drive accountability. A sales rep understands his or her goal, a clinician understands his limit for new referrals in a week. Territory selection polygons could also be generated by drive time searches. Import a list of home addresses for your sales representatives. Conduct a drive time search from each home location searching 60 minutes in all directions. This drive time query will establish a jagged polygon representing a drive time of one hour along every possible road connection. Next, use this polygon to select your ZIP codes list for territory creation. Now your sales people understand how their proximity to home relates to their territory size. This approach is perfect for controlling travel expenses and minimizing sales overlap. Once created and imported, territory maps can be easily adjusted. After all, nothing stays the same for long. You can simply click on ZIP codes, counties, state or Census tracts and add or subtract them from the target territory. Maintenance is easy as a mouse click. Territory mapping software is applied by millions of organizations to define areas of responsibility and measure progress against goals and objectives. Territories help to organize business processes for industrial sales, healthcare, field services, retail services, marketing agencies, and subscription managers – to name just a few types of businesses that use territory mapping. Business mapping software, supporting territory alignment, is so affordable and easily applied today that companies without sales territories often go quietly out of business, never realizing what went wrong. Don’t be that company. This entry was posted in Uncategorized and tagged Business mapping software, how do I create a territory, industrial sales, sales territory map, service organization sales and marketing. Bookmark the permalink.